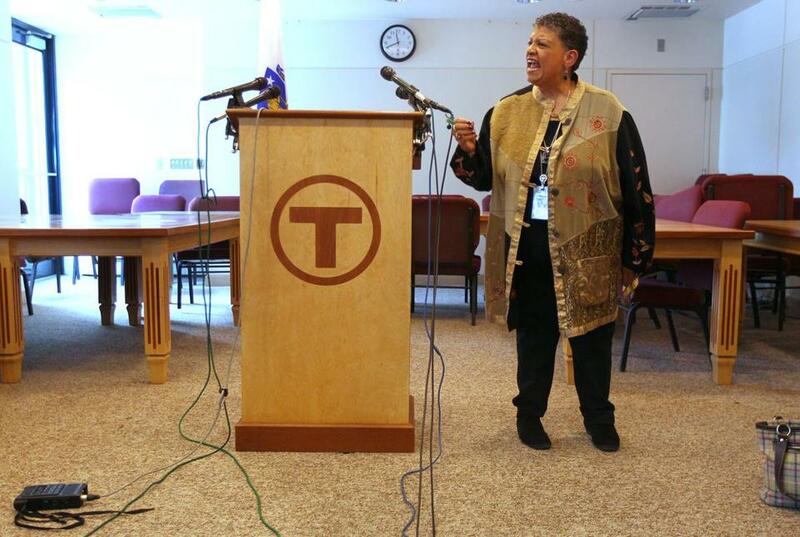 Beverly Scott, general manager of the MBTA, was often fiery in her response to questions about T operations and her performance Tuesday. A gathering storm swirled near South Station on Tuesday morning, an ominous system propelled by politics, not polar activity. As the aging Massachusetts Bay Transportation Authority system surrendered to the newest snowstorm, General Manager Beverly A. Scott, a woman squarely in the cross hairs, was a portrait in serenity as she sat in the T’s operations control center, surveying flat-screen monitors that showed empty platforms from Braintree to Riverside. Scott has come under fire in recent days from Governor Charlie Baker who has expressed his frustration and dismay at the rough-winter performance of the mass transportation system Scott has directed since 2012. If Scott has a bull’s-eye on her back, she doesn’t act it, focused instead on digging out trains, plowing 4-foot snowdrifts, getting her system back in business. Baker and Scott are scheduled to meet on Thursday. Wouldn’t you love to be a fly on the wall for that tete-a-tete? Although he’s backed off from his ready-for-the-guillotine rhetoric of earlier this week, the governor is clearly not happy with the T’s leadership. But he’s also fooling himself if he thinks collecting Beverly Scott’s scalp is going to solve a chronic problem of deferred maintenance and paltry capital investment. No, it’s not. And few people know that better that D’Alessandro, the former John Hancock chief who led a top-to-bottom 2009 review that concluded the T was virtually bankrupt and perilously unsafe. If Baker wants to get to the root of the problem, he doesn’t need to travel to the T’s headquarters to see Beverly Scott. The governor should just walk down the hall at the State House and have a talk with Speaker Robert DeLeo, Beacon Hill’s self-appointed indispensable man. The can now stops with Baker, who said Tuesday he’s reluctant to embrace higher taxes or fees to fix the T.
Strong and expensive attempts to improve the state’s transportation network have been whittled down by lawmakers and rejected by voters who are now learning this immutable lesson: We get what we pay for. No one would hold up the T, with its bloated pension plans and its underfunded expansion, as a model of efficiency, even as senior T managers took shovels Tuesday to help dig out a stranded T train in Quincy. Baker said Tuesday that he has no direct authority over MBTA operations. But if the governor wants Scott gone, it’s hard to imagine her surviving. In any event, Scott says she’s at peace. Lopping off the T’s senior leadership might be expedient. But the real issue is going to require something exceedingly rare on Beacon Hill: resolve and leadership and lots of money.